1) Where are you from? Your profession? I currently split my time between St Augustine and Gainesville and have been in Florida since 2009 after relocating from Chicago for my job (SVP Wells Fargo). 2) When and how did you become interested in paddling? I have always loved the water and have served in the United States Coast Guard running search and rescue missions mostly on the Great Lakes. It was in the 90's while I was up in Michigan that I first became introduced to kayaking. I bought my first kayak at Canoecopia in Madison WI in 2000 and took classes first at Rutabaga and then on the Wolf and Eagle rivers (whitewater). 3) Where is your favorite place to paddle? 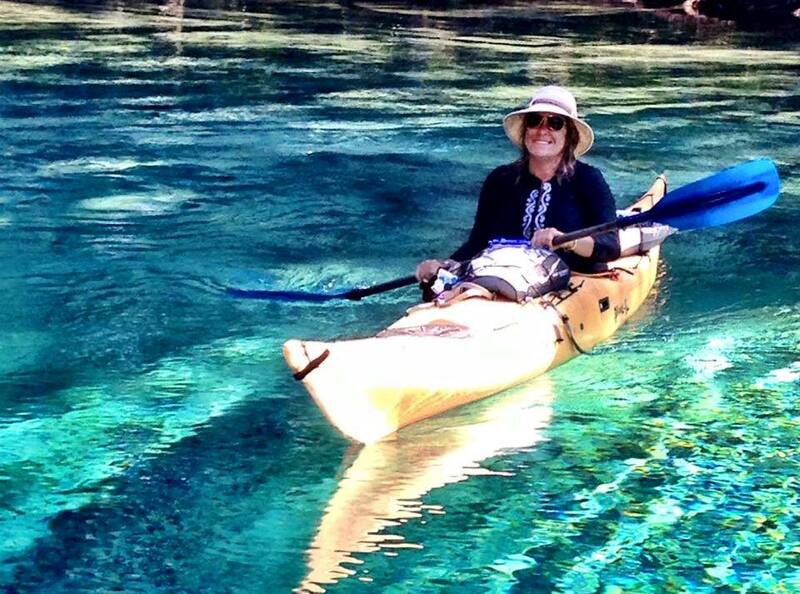 My favorite places to paddle are any of the springs and the Keys in Florida, Peninsula State Park and the Apostle Islands in Wisconsin, the Mexican Baja, and Escanaba, Michigan. 4) What’s the most interesting thing that ever happened to you on a paddling trip? The reason I paddle is because of the wonderful group of people you meet while on the water and the sense of total peace you have while surrounded by nature and wildlife. There have been so many beautiful and amazing places and wildlife that it is difficult to choose just one. I think one of the most amazing paddles was coming up on a flock of white pelicans on Lake Mendota in Madison, WI. 5) How many Paddle Florida trips have you gone on and to where? I have been on the Florida Keys Challenge, the Dam to the Bay trip on the Ochlockonee, the Suwannee River Paddling Festival, and the recent Bartram History Paddle on the St. Johns River. 6) Describe your new role with Paddle Florida. I am Paddle Florida’s volunteer coordinator. In this role, I work together with volunteers to coordinate the needed activities for each trip. We are lucky to have very seasoned paddlers who join us on the water and who are there to assist paddlers as they journey from launch to finish each day. These volunteers also assist with the many camp tasks to ensure a great trip for all who join us. 7) Can you describe a Paddle Florida trip highlight? For me, the highlight of every trip is the camaraderie and friendships that are built. I really like that each trip is an opportunity to visit and build relationships with the paddlers who join us. It is really fun to get to know them personally, to have them share their experiences, and to see them on subsequent trips. 8) What advice do you have for folks considering a Paddle Florida trip? Just Do It! The trips are really well done. The people, the campsites, the paddling, the food, the entertainment, and the speakers are outstanding. I have participated in many trips before, but never where the food was catered and all you had to worry about was getting out and paddling. Even your gear is hauled for you. I really enjoy the opportunity to learn something new about the environment or be entertained with live music at a campsite while listening to the ocean! Just amazing.